My husband and I love dressing up every year for Halloween. 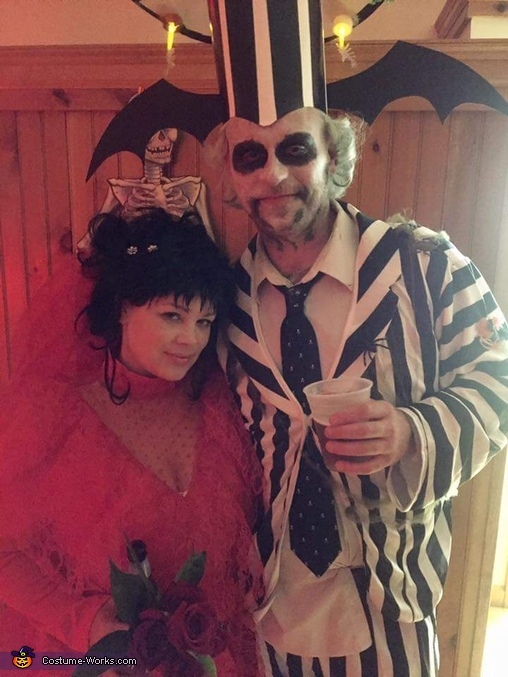 Jamie Mangin as Lydia Peter Mangin as Beetlejuice. Beetlejuice was one of out favorite movies growing up. These costumes were very fun to make our friends helped make them. Remote control airplane for the hat as it lite up and moved like a real carousel would.run time was 8 mins. Black skeleton egg for the top of the hat. Black & purple and white makeup. Black white jacket and pants. Attached is a short clip to show that hat in the making..